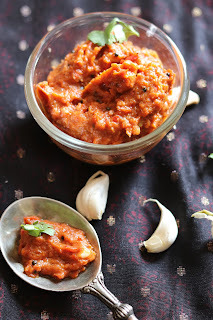 Lehsun ki Chutney is spicy, hot garlic chutney which is specialty of Rajasthan, India. 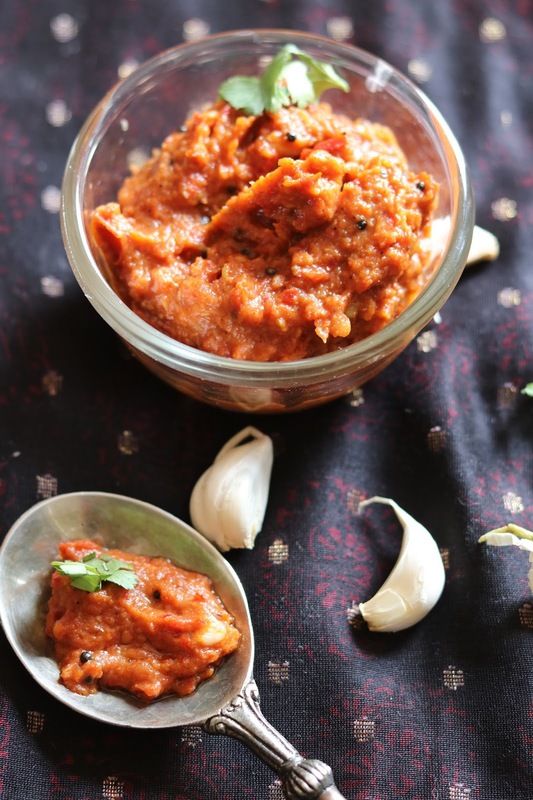 It is usually served with roti, stuffed parantha or the famous 'Dal Batti Churma'. Garlic chutney tastes very different from other kinds of chutney because of the ingredients involved. Try it to taste it. 1. Heat 1/2 tsp mustard oil in a kadai or non-stick pan. Saute onions, garlic for 2-3 minutes till these become golden brown. 2. Add tomatoes, red chili along with all spices and cook the mixture for 10- 15 min till soft. 3. Cool the mixture and grind to form a coarse garlic chutney. 4. Tempering - Heat 1/2 tsp mustard oil in a kadai, sputter mustard seeds along with a pinch of red chili powder. Pour this tempering on to the chutney and mix well. 5. 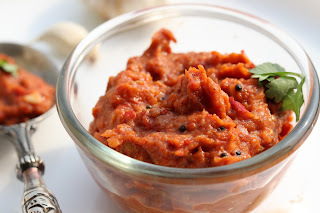 Hot garlic chutney is ready to serve with roti or parantha. Note- If the red chilies are too dry, then soak in water for 10-15 min and then add in the mixture.